Last fall, ESF graduate student Rakhshinda Bano grasped an opportunity to learn about solving environmental problems in her native Pakistan by collaborating not only with her international classmates on campus but also with students at a university in the Netherlands. Bano was one of seven ESF graduate students in an experimental new course, International Environmental Policy Consultancy (EST 696), that used collaborative distance-learning technologies, including videoconferencing, as tools to create policy briefs and scientific digests that were submitted to the United Nations Division of Sustainable Development's Policy Analysis Branch and will potentially be used in the U.N.'s 2014 Global Sustainability Report. The report will focus on developing environmental issues and recently developed sustainability solutions. The ESF students met twice a week in a Baker Laboratory smart classroom to video chat with students at Wageningen University, a Dutch public university and agricultural research institute with 10,000 students from more than 100 countries. Bano, who in her environmental science master's research is studying how the Alpine wetlands in her homeland are threatened by insufficient environmental policies, said the course gave her invaluable practical consulting skills to work toward her goal of promoting policies that conserve resources from these wetlands. "The health of communities is dependent on these wetlands for food and agriculture," she said. She added the international collaboration aspect of the course made it a realistic way to learn consultancy skills. "It was a really great opportunity for me to build my career," Bano said. Dr. David A. Sonnenfeld, a professor in ESF's Department of Environmental Studies who organized and taught the course with Dr. Bettina Bluemling of the Environmental Policy Group at Wageningen University, said he doesn't know of any other college course that has combined online international collaboration and students working as "externs" for a client such as the U.N.
"What we are doing may be unique as a whole by putting those two things together," he said. "We've been pushing all kinds of envelopes, in terms of coordination and communication." The course was a new endeavor for both ESF and Wageningen University. It was supported in part by a distance-learning innovation grant from Wageningen University and received strong support from administrators at both institutions. Bluemling said it was a rewarding experiment because it was one of the first times that Wageningen University had collaborated with students in the United States using only online software. "The students found it to be a very stimulating experience," Bluemling said. There were "many interesting commonalities" between students at the two universities, Bluemling said. Wageningen students thought that it was beneficial to work with ESF students because they have similar academic backgrounds but different cultural perspectives, she explained. The ESF class included students from China, Colombia, Indonesia, Pakistan, the Philippines, Tajikistan, and the United States. Wageningen students had academic backgrounds in forestry and nature, landscape planning, and biology; they came from Finland and Italy, as well as the Netherlands. ESF initiated the aspect of the class that involved working with the United Nations based on connections through faculty and successful graduate interns. The official who leads the U.N. Policy Analysis Branch, who has known Sonnenfeld for many years, welcomed working with the class, Sonnenfeld said. The distance-learning aspect of the course came about, in part, because SUNY schools are leaders in global communication through the SUNY Center for Collaborative Online International Learning, Sonnenfeld said. "Although this course is not being done under the auspices of COIL, from the beginning we've been in conversation with them and gotten ideas from them," Sonnenfeld said. "It was kind of the spark that got this going in the first place." The idea for a policy consultancy class stemmed from a short course called "Superpowers in Environmental Politics: China and the U.S." that Sonnenfeld had co-taught at Wageningen University in June 2007. After coming to ESF, Sonnenfeld tried to initiate the course again in the Netherlands in the spring of 2009, this time including ESF students. But costs of travel and accommodations discouraged ESF students from enrolling. So Sonnenfeld and Bluemling, with encouragement from campus administrators, turned to distance-learning technology. They had intended to involve students at Renmin University of China, a major research university in Beijing, but the Chinese students were unable to participate, in part due to technical difficulties. The collaboration between ESF and Wageningen University students succeeded despite some differences in the dynamics of how the courses were taught at the two universities. The main distinction was that for the Wageningen students, the course was part of a required, graduate-level consulting program. At Wageningen University, the course is called "Academic Consultancy Training" and is a 40-hour-a-week commitment. The ESF students, on the other hand, were balancing other academic commitments because the course was offered as a three- to four-credit elective. An additional credit was offered if students opted to continue their work for two weeks after classes ended for the first semester, meaning they did not finish until Dec. 21, to finalize and deliver the reports they'd created for the U.N. All ESF students opted to work the extra weeks. 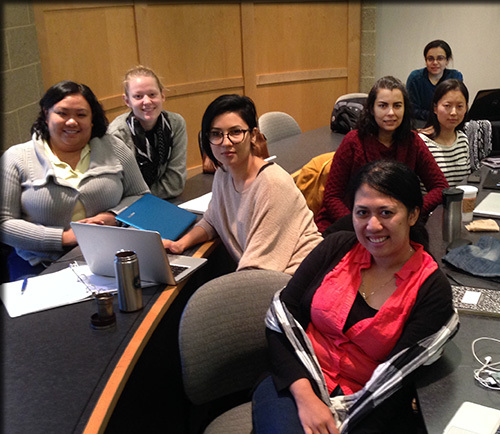 Cherry Ignacio balanced the course with her doctoral work in biophysical science at SUNY Upstate Medical University. She said the course was a prime opportunity to improve public speaking "soft skills," that must be learned practically, such as controlling tone, body language and pacing when speaking. Other benefits she gained from the course included teamwork skills and a unique bond with her classmates, she added. Ignacio considers these social skills particularly important and sometimes overlooked by scientists and students hoping to be scientists. "It was really eye-opening for me as a scientist who doesn't spend much time talking about policy issues," Ignacio said. "Overall it was very rewarding."